As you might expect, Grumpy’s story began in the Netherlands (or “Holland” as some of you folks would like to call it). He was born to the de Vaart family on a cold winter’s day in a humble farmhouse that was split, right down the middle, by the Friesland-Groningen border. This was the de Vaart’s first son, and they proudly named him Aart. Yes, Aart de Vaart. Aart grew up helping his family on the farm, but his real passions involved raising world-class Frisian horses, creating a hybrid of an almond tree that flowered with tulips, and revolutionizing uses for wind energy. Aart’s life was pretty great until his luck seemed to take a turn for the worse. One day, Aart got a little too close to the tail of one of his prize horses when he was lighting his pipe, and accidently started the horse’s tail on fire. The horse, obviously spooked by the fire on its hindquarters, took off and ran through the hybridized almond-tulip orchard. 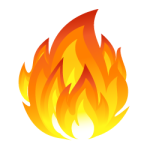 The horse’s frantic pace, fueled by the occasional horse fart, fed the flame even hotter as the horse’s tail ignited the orchard into an incendiary blaze. Aart lost all of his almond-tulip research and all but one of his prize horses that day. In an effort to clear is head, Aart saddled up his only remaining horse and went for a ride along the beach of the Waddenzee. The sand and the sun were helping Aart come to terms with the recent horrible events, when suddenly his horse fell into a giant hole. The hole, which was reportedly dug by a German tourist, nearly took Aart’s life. Unfortunately, Aart’s horse was never seen again. With all of his horses and almond-tulip hybrids gone, Aart decided to focus on his idea of turning wind energy into electricity! However, as he started, he soon learned that his plans had been stolen by an overzealous environmental company, who were now using his ideas to put up ugly, spindly-looking “windmills” all over his homeland. 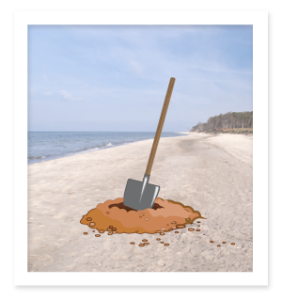 The combination of these life changing events understandably made Aart, ….well, grumpy. Aart’s friends started calling him “Grumpy” as a joke, and the nickname stuck. Grumpy then went through a darker period of his life. 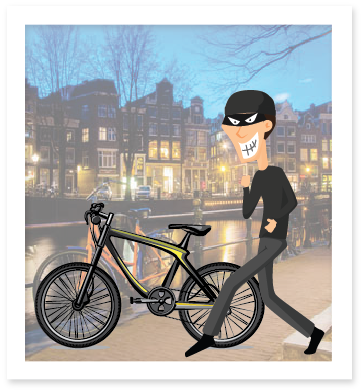 For a short time, Grumpy ran a secret bicycle smuggling ring that rounded up bicycles stolen by Germans during WW II, and snuck them back across the Dutch-German border. During one of his late-night bicycle smuggling missions, Grumpy stopped to pump the Mayor of Dusseldorf’s pool water into his basement. What should have been regarded as a good-natured, practical joke only infuriated the German mayor, who pledged to rally the City of Dusseldorf and the rest of Germany for revenge on Grumpy and the country that he loved. Not wanting to risk another invasion of his homeland, Grumpy left for the Americas. Grumpy soon arrived in New Amsterdam, and was quickly disappointed to learn it had been renamed to New York. Additionally, all the town names were spelled wrong, and the Noord River was now called the Hudson! In total dismay, Grumpy picked up a hunk of cheese and a map, and sat down to search for a new place to call home. As he snacked and searched, a small piece of cheese fell on to the map. As he brushed the cheese aside, he saw it. Call it fate or predestination; the cheese had fallen right on the marker for Holland, Michigan. Grumpy was excited for the first time since leaving the Netherlands. Holland sounded like a place where the streets were lined with tulips and had all the pannenkoeken a Dutchman could eat. He packed bags and left that that afternoon. Grumpy arrived in Holland three days later. He was down to last stroopwafel, but it was worth the trip. The streets were, in fact, lined with tulips, and Grumpy ate pannenkoeken till he made himself sick. Holland had lots of water, fertile fields, and no hole-digging Germans. This would be his new home. Grumpy soon found work as a farmer until his back went out, a wooden shoe maker until those new-fangled rubber-soled sneakers became all the rage, and even lasted one full day as a tour guide at a local Dutch-themed attraction. Apparently, Grumpy doesn’t have the gift of hospitality. Grumpy eventually found his niche as an ink mixer and a screen maker at a small t-shirt shop. Although excited about his new job and thankful for the work, he realized that the existing Dutch t-shirts were boring and un-original. 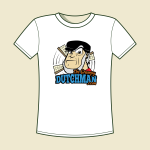 Dutch t-shirts needed to be witty, snarky, maybe even a little bit grumpy, but most importantly be clothing that any self-respecting Dutchman would be proud to wear. Grumpy started creating a new line of t-shirts. The new shirts were an instant hit, and sold like hot pannenkoeken! 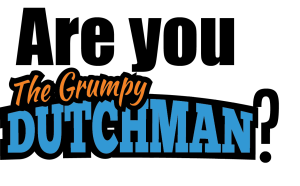 Grumpy was quickly promoted to the top of the company, where he also started designing shirts for kids and newborns. They too were a success, skillfully combining cuteness and comedy, one shirt at a time. As it turns out, Ol’ Grumpy has a soft spot for the mini-Dutch. 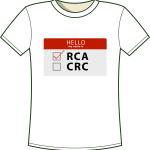 Due to the overwhelming success of his business, even Grumpy’s church once asked him to design some shirts to promote unity between RCA and CRC congregations for an upcoming town picnic. As you would expect, Grumpy’s t-shirt designs weren’t exactly what the pastors had envisioned. Although these were not the typical religious-themed shirts, they were an instant hit at the picnic. These original shirts are now highly collectible, and are secretly worn under the pulpit robes of many Dutch pastors. Through Grumpy’s hard work and ingenuity, he was eventually able to purchase the company. 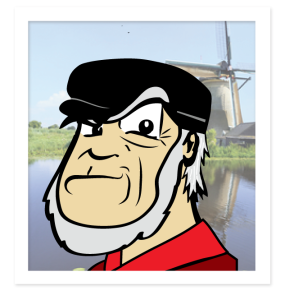 Although he’s still hard at work, Grumpy finds time to take road trips and vacations …as long as the destinations are somewhere inherently Dutch. You can find him in the usual Dutch towns like Holland, Grand Rapids, Zeeland, Fulton, Pella, and Orange City. However, he’s also been spotted in places like Ripon, California, Little Chute, Wisconsin, Lynden, Washington, the Gallatin Valley of Montana, several places in New York and New Jersey, and many, many more! Just in case you still didn’t feel like you knew Grumpy well enough, we have included a list of some of Grumpy’s favorite things. And, by request of Grumpy himself, we have included another list of things the old codger isn’t so fond of. You might be surprised just how much you have in common.